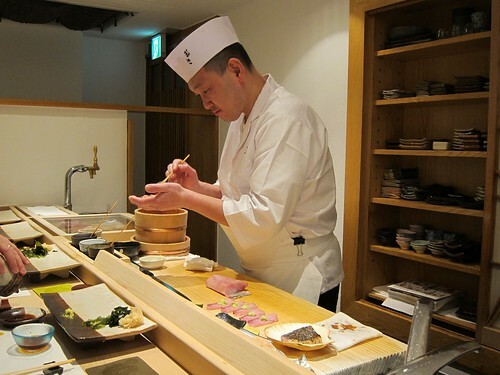 To my knowledge, no one has made a documentary about Masakatsu Oka, the head sushi chef of Sushisho Masa in the Nishi-azabu district of Tokyo; nor has anyone documented his sushi with astonishing cinematography. But I spent not 20 minutes, but over 3 hours, at one of a total seven seats at his sushi bar, the entirety of the restaurant which rests at the bottom of a staircase that descends from behind an obscure door at street level. Catty corner lies the Gonpachi at which that crazy blood-spurting Kill Bill scene was filmed, but there was nothing flashy about Sushisho Masa – it was 100% substance. I laugh at how much I was bombarded with “Are you going to Jiro?” inquiries in the months before my trip, at the mere mention that I was spending time in Tokyo. Including the rotating four or so differing yet amazing sakes, I spent less than I would have in 20 minutes at Jiro’s famed subway restaurant. I have decided that to attempt to eat sushi in the States with this experience even remotely in memory would be unfair to all parties involved. This decision is what I facetiously call my burden to bear. A sincere thanks and heartfelt gratitude goes to a Dr. Tomo Kurokawa, my impressively bilingual host and guide, who took me here. I made a point of not reading up on either of the two reservations she made on our behalf, so the experiences would come with as much surprise as delight (I’m glad I did; I found out Ruth Reichl beat me here). Not only did she know all the English names of each fish that crossed my plate, I wasn’t even familiar with so many of the over 40 pieces of sushi and sashimi that did so over the course of the meal, since many aren’t available in the States. The next morning, I’d see some of them alive and whole at the famed Tsukiji Fish Market, and I tried to tie the two memories together. Wasabi was grated throughout the whole meal for ultimate freshness. Instructions on how to enjoy each piece (wasabi, no soy; wasabi and soy OK; or, as is) were given. And front and center was the artfulness that was Chef Oka’s approach. Two, even three, parts of the same fish, served in succession while prepared in a different manner: As nigiri, as sashimi and/or cured, marinated in kelp or soy, even seared. The skillful cuts in each fish that open up the flavors and textures of each fish the only way Chef Oka knows how. The care, attention and skill to each minutae of the meal was like nothing I had ever experienced – and that’s without describing how each piece, when meant to, simply melted in my mouth. To chew would be a disruption. Each preparation was customized and complementary, with the quality of each fish being allowed to shine, first and foremost. To describe each piece would fail to do it and the entire experience justice. The only thing that would is a visit, in the flesh. So if you know that you will be in Tokyo, be sure to make a reservation far in advance and go. Reservations made well in advance (>1 month) recommended. This entry was posted in Food, Sake, Travel and tagged chef, Japan, Masakatsu Oka, Nishi-azabu, restaurant, sashimi, sushi, Sushisho Masa, Tokyo. Bookmark the permalink.